Seal coating protects your Severna Park asphalt driveway from weather damage, automotive fluids, and every day wear and tear. It also give your driveway a beautiful finish. Kelbie Home Improvement, Inc. has been seal coating driveways in Severna Park, Maryland for 37 years. Get premium weather protection with a professionally applied seal coat by Kelbie Home Improvement, Inc.. Our professional staff will get the job done right the first time, making your driveway beautiful and safe. Call (301) 232-3342 today for a free quote. Driveways take a beating from the weather, vehicular traffic, chemicals, and pedestrian traffic. 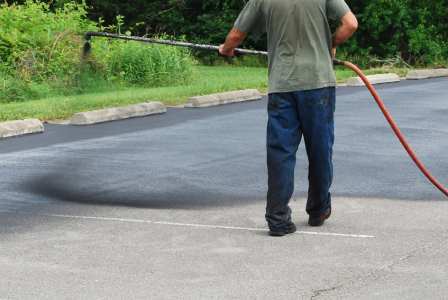 Make sure your Severna Park, MD asphalt driveway is up to the task with a premium seal coat, applied by the experts at Kelbie Home Improvement, Inc..
We use a sand slurry mixed with sand for the best seal coat performance. The Kelbie Home Improvement, Inc. seal coating process includes asphalt cleaning, pre treating chemical spills and cracks, and hand applied seal coat. For premium asphalt maintenance in Severna Park, call (301) 232-3342 to schedule your residential driveway seal coating job. A properly seal coated driveway is much easier to maintain and is safer for your family. In fact, regular asphalt seal coating makes your driveway safer for your vehicles, too. Once you have asphalt erosion, frost heaves, or potholes, the only solution is to completely resurface your asphalt. Proper maintenance of your Severna Park driveway saves you money by preventing costly repairs. Make your life easier by calling the Severna Park seal coat specialists at Kelbie Home Improvement, Inc. for a professional seal coat application: (301) 232-3342. Get rid of the bumps in your road. An asphalt driveway doesn't last forever. But you can make it last longer by calling Kelbie Home Improvement, Inc. for professional asphalt seal coating. Kelbie Home Improvement, Inc. has been seal coating residential driveways in Severna Park, MD for 37 years.